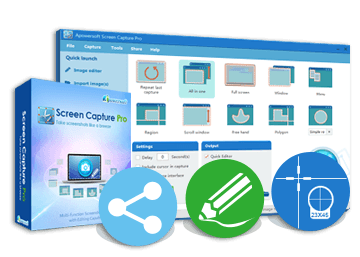 Apowersoft Screen Capture Pro is a simple yet powerful screenshot and screen recording program, capable of taking snapshots and video recordings of anything displayed on computer screen. It can be used to capture webpages, video, gameplays, documents, menus and many more. Moreover, it can also create schedule tasks for taking snapshots at customized intervals and in desired region, which is nice to child surveillance and stock trade info collection. Aside from taking screenshots, you can use its instant image editor to make some annotations to the screenshot. Options like arrows, lines, rectangles, highlight, text can make your image more valuable and understandable. If you pursue a more advanced way to retouch your local image or screenshot, then you can make use of its advanced image editor. You can crop, resize the screenshot or add some special effects like shadow, sharpen, pixelate, etc. For the purpose of image sharing and storage, this screen capture program also enables you to upload the captured image to free Cloud space provided by its developer. You can set password on pictures for the security protection of the image you uploaded. Once an image has been uploaded, you will be given buttons to share this uploaded image via social networks and four kinds of image links for sending the image online or inserting into blogs or forums. Amidst its diverse functionalities, screen recording is another important feature which gives you quick access to capture screen activity in five recording modes. And the recorded video can be saved in most common video formats such as WMV, MP4, MOV, MKV, AVI, etc.